A week after Linda Louise Eastman (*1941 – †1998) married Paul McCartney, John Lennon (*1940 - †1980) and Yoko Ono had their wedding service in Gibraltar on this day in 1969, traveling to Amsterdam five days later for their honeymoon. 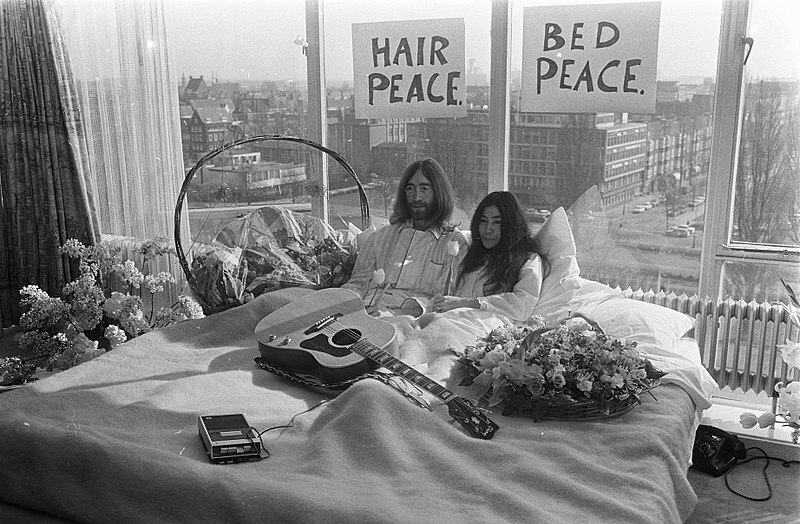 Knowing that their marriage would be a big press event, the couple decided—at the height of the Vietnam War—to put the media attention to good use and staged the first of their weeklong Bed-Ins for Peace. An international contingent of journalists were invited into their bedroom in the presidential suite of the Hilton Hotel daily from nine o’clock in the morning until nine o’clock at night. Afterwards they dashed off to Vienna, sending acorns to heads of state around the world in hopes that they would plant them and rear oaks as symbols of peace.